In this edition of Designer Spotlight, we highlight our conversation with Angela Giguere-Kumble of AMG Interior Designs. Angela began her career 18 years ago buying homes and completely refurbishing them. Over time, she fell in love with the idea of working with interiors; her passion had taken her indoors. Angela’s own home in Newport, Rhode Island is decorated in a traditional style with décor that she has accumulated throughout her life as an interior designer and collector. Her home is also uniquely constructed of stone, which reflects of Angela’s love of architecture, the element that has influenced her interior design the most. Throughout the years, her style has evolved depending on her surroundings. Currently, Angela aims toward Art Deco and contemporary. Her take on Art Deco is not quite as hard-edged as the original style that inspires it; she adds unique pieces to set her rooms apart and make the work her own. Angela’s first step when designing is literally to step into the space. From there she begins to get a feel for a vision of the room, imagining what might work there. Physically being in the room itself allows her to see its true style potential, which can be anything from traditional Americana to contemporary French - whatever feels the most appropriate to the room. At the same time, she always considers what the client actually wants, as each client is a unique individual with their own thoughts, ideas, and visions for their home. More rooms featuring STARK fabrications, for the Palm Beach home shown above. Most of Angela’s style comes from the needs of her clients. AMG Interior Designs is based out of Rhode Island, but Angela works in both New York City and Palm Beach, Florida. She attributes her success to STARK for the artistic flair provided by the custom carpets she loves to use in her designs. "STARK gives me the luxury to experiment. The design team is very easy to work with, which is why I love using them. They never make you feel crazy or get upset with your needs. You’re spending a lot of time with them, and it can often be difficult to redesign a carpet to the exact needs of a client. STARK’s design team is always so accommodating. 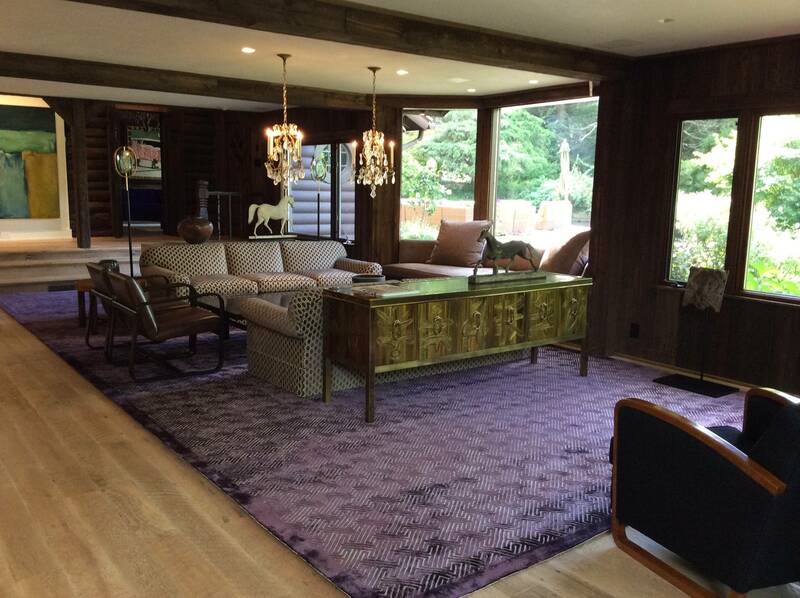 A purple STARK rug stands out against wooden flooring. When incorporating STARK carpets into her interior design plans, Angela often makes them the focal point of the room. With carpets available in a multitude of colors and styles, in addition to custom pieces made possible with our custom fabrication abilities, Angela is able to style each room with a carpet that becomes its own unique piece of artwork. Angela believes that the intricacy of the design in a custom carpet makes it a piece of art and the natural focal point of a room. As such, the rest of the room should be designed around the carpet. Once the flooring has been chosen, Angela’s experience is that it’s simple to find items that accent the colors or patterns highlighted in the carpet. 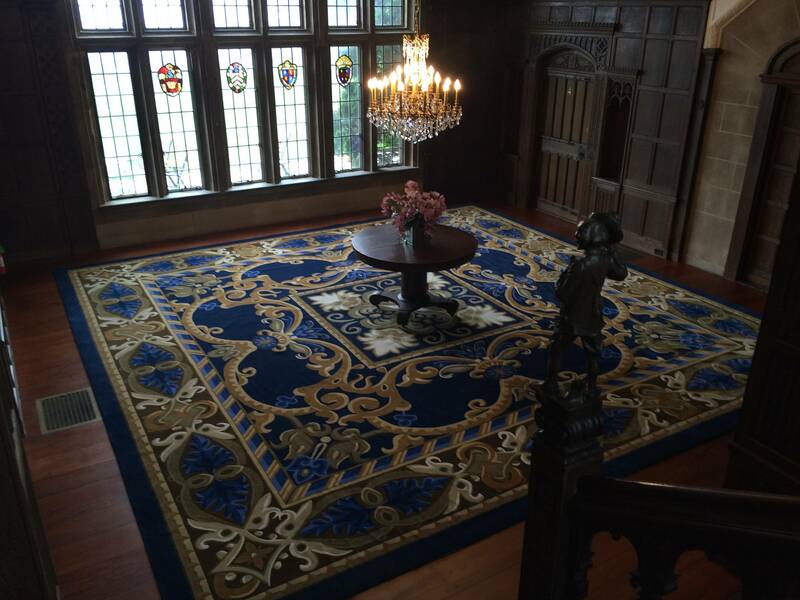 A custom rug created by STARK for one of Angela’s more traditional projects. As a long-term partner of Angela’s, we hope to be featured in many of her designs for years to come. Known worldwide as a staple for luxury design, STARK is proud to offer partnered designers the best opportunities possible through our trade benefit program, and other trade-preferred services. Explore the World of Stark for even more designer interviews, Ashley’s Window Room Features, and more information about what we do and how we do it.